Everyone has a Melting Point, that critical psychological threshold we face when under massive stress and pressure. Despite knowing the risks, we can’t stop ourselves from melting down. We start to lose our grip and internally derail, performing badly. If we were hoping to project an image of competence or trustworthiness, it goes out the window. And our career may stall as well. But we’ve all seen top executives and sports stars who perform at their best under intense pressure. They’re calm, focused and even playful while others are buckling from stress. No matter the heat, they stay cool. That high Melting Point is a defining quality of high achievers. Define who you are. Your core values and fundamental purpose in life and work are your North Star. They’re what you believe in and what you want to bring to the world. But when you hit that point when you’re doing something that makes you forget your purpose, it can create friction — and friction generates heat. To raise your Melting Point: Take some time to write down your purpose and values. Then, every morning before work, spend 5 minutes reading it over. Reminding yourself of why you’re here and what you care about will keep you centered, even as the day’s issues try to knock you off balance. Prepare for the tough moments. All of us have key moments when we’re called upon to be our best. It might be giving a speech and knowing we’ll face tough questions, or taking the lead on a complex project that requires more time than your team has. To shine through that superheated combination of pressure and adversity takes mental and emotional preparation. To raise your Melting Point: At the start of each month, spend 20 minutes listing the tasks at hand, and identify which will be key performance moments. Then commit to preparing well ahead of time. It’s also a good idea to revisit that list of your core values and purpose, so you’ve got a firm footing as the pressure mounts. Make room for your life. Not making time for loved ones can spark tension at home that simmers into your workday. Balancing work and life requires effort on both fronts. At work, clearly manage expectations with colleagues and bosses, and assert yourself in the face of unreasonable or unrealistic requests. At home, share your work calendar and give advance warnings about upcoming trips, meetings, or crunch times. Being clear makes you a trustworthy, transparent and honest team member — and that includes the home team. To raise your Melting Point: Set up regular meetings with your work teams to ensure constant communication and alignment — the clarity will minimize those 11th hour emergencies. At home, set up regular quality time with your loved ones, such as 90 minutes with no devices, or a weekly movie night. Schedule it into everyone’s calendar — and make it just as much a priority as a work meeting. Budget your energy. Bad daily habits rob us of energy so we lose momentum and focus, leaving the office spent. We experience the kind of exhaustion that leaves our nerves raw — and puts us at greater risk for meltdowns. By allocating time and energy for exercise, walking breaks, healthier meals and more sleep, we’re actually more efficient and productive, and feel better about ourselves. To raise your Melting Point: Monitor your daily energy level by keeping a log for three days. Note when you’re worn out, and mention what you ate, drank, or did. As a pattern emerges, you can start swapping out bad habits for better ones — smaller portions at lunch, less coffee and more water, more exercise. Whatever makes you feel energized, stick to it. When good habits become routine, you don’t have to expend energy making yourself do them. Disconnect for better sleep. Sleep is critical for managing stress and recuperating. But between the pressures of the job and our “always on” connection to computers and phones, heading to bed clearheaded is a challenge. End-of-the-day rituals can help put you in the right frame of mind to experience deep and rejuvenating sleep. To raise your Melting Point: In the evening after your workday, disconnect. Put all devices in a dedicated room, and leave them there. Only make an exception in a business emergency. Keeping your mobile phone and laptop out of the bedroom can transform the quality of your sleep. The room becomes associated with rest and recovery: a screen-free, calming space to cool your head. Intensity is going to happen, no matter what our fields — and there are plenty of factors beyond our control. But truly high performers learn to raise their Melting Points, and knowing they’re not at risk for derailing gives them even more confidence to take charge and prevail. So tap into your own mental and emotional strength, and tend to your whole life, not just your work. Raising your own Melting Point will give you the coolness and resilience to reach a new level of personal best. Dr. Christian Marcolli is a top performance coach whose global roster includes executives and business leaders, market-leading brands and Olympic champions. He is the founder of Marcolli Executive Excellence, a boutique-style consulting firm focused on fostering personal leadership excellence, driving team effectiveness and creating organizational health. 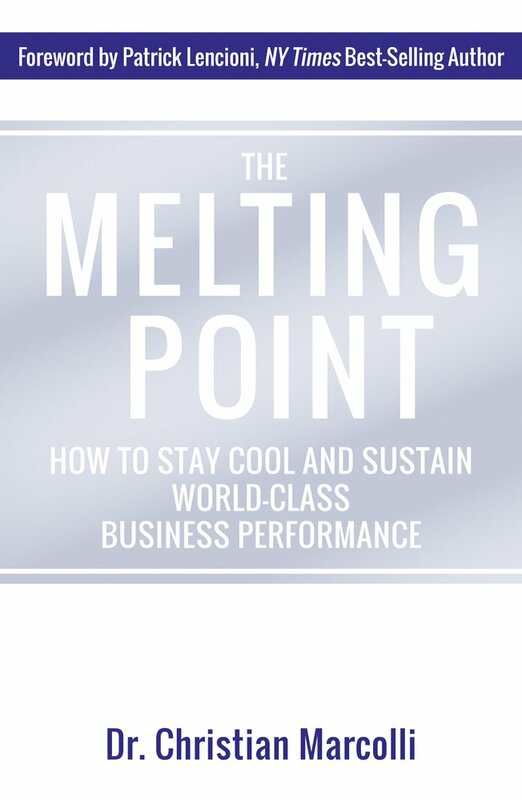 An in-demand speaker, he’s also the author of More Life, Please!, Teach Me Patience – NOW!, Equip Yourself To Be a Business Champion, and The Melting Point: How to Stay Cool and Sustain World-Class Business Performance.